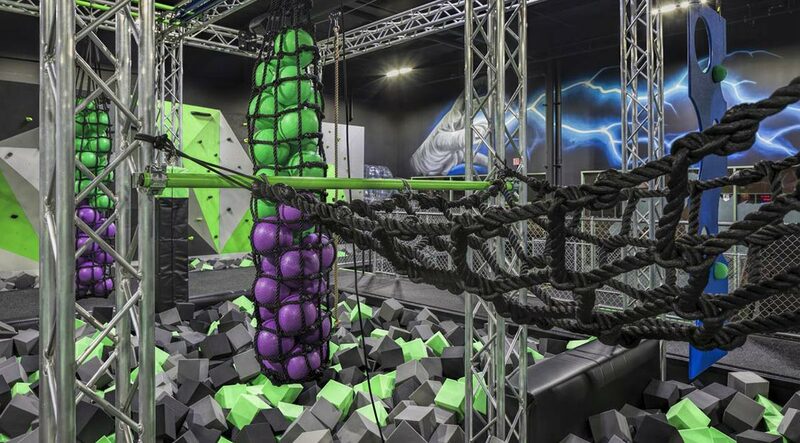 With rock walls, trampolines, and obstacle courses, the LA-based gym DojoBoom offers athletes weary of the same-old-same-old the opportunity to bounce, climb, and hang on for dear life with help from a bona-fide American Ninja Warrior. To warm up for my workout at DojoBoom, a 37,000-square-foot gym that recently opened just outside of Los Angeles, I didn't jog around the block or jump rope. Instead, I hopped onto one of the three slacklines suspended above a foam pit. Then I realized: tightrope walking is hard. After wobbling more than I walked, I headed toward the aerial yoga apparatuses. (They're basically climbing ropes, except sheets of fabric.) My hip mobility isn't great, but I figured I could crank out some suspended pullups, until I saw a teenage girl holding a full middle split eight feet above the ground. Get into warrior mode with these endurance-testing exercises. So I headed to the trampoline room, figuring I could warm up the legs with a few jumps. But the guy already in there started his bouncy-house session by falling backward from a six-foot ledge, which is a little too reminiscent of how I broke my neck doing parkour. I kept walking. To be fair, I'm reasonably fit. I work out several times a week. Hell, I competed in American Ninja Warrior back in season 7 of that show. But after reckoning with three of the many absurdist obstacle courses in DojoBoom, I started wondering: Am I extreme enough for this? 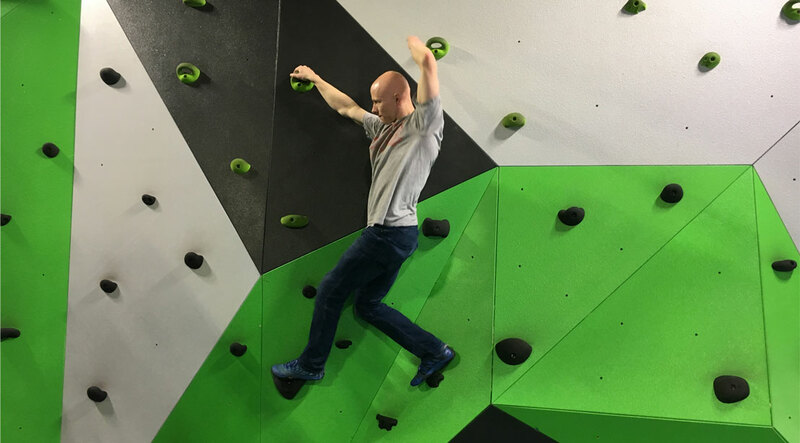 A little less confident than when I walked in, I made my way to the bouldering wall (because DojoBoom has one of those, too) to meet the gym's manager, four-time American Ninja Warrior competitor Kevin Bull. Bull used to be a full-time finance guy, which he quit to do, well, this. It's a dream job, the product of both hard work and luck. During college, Bull won championships as a decathlete, sprinter, and pole vaulter, which helped him develop fast-twitch muscle and otherworldly hand-eye coordination. At the same time, he discovered parkour, which honed his jumping, balance, and speed. In 2014, he decided to test these skills in the most appropriate way possible: American Ninja Warrior. And when his audition video wasn't accepted, he showed up in Venice, CA, anyway and waited hours for the chance to walk on. When he finished the course, his was the fourth-fastest time of the night. "I usually try and do two laps back-and-forth," Bull said as he climbed onto the bouldering wall and started gliding sideways. "That way I can get a flash-pump in my forearms, and then I rest for twenty minutes or so and let them recover." (Back when I competed on Ninja Warrior, I'd been bouldering three times a week, but I'd barely touched a wall since, and Bull zoomed past me.) Thankfully, we only climbed for about ten minutes. And then Bull and I do flips in the adjacent foam pits, because that was the logical thing to do in this Wonkaverse of a gym. From there, we moved to the centerpiece of DojoBoom's repertoire: the mock ninja course. Thankfully, I still made it through the "easy" obstacles, like swinging rings and hanging ropes. I even managed to grab onto a swinging trapeze and transition to another bar. At that point, however, I realized that while Bull's grip may have fully recovered, mine had not. As soon as I jumped to the hanging silk, it slid through my hands, and gravity took over from there. At this point, a gym full of stationary treadmills and dumbbell racks started to seem enticing. Globo gyms are, after all, familiar. But compared to DojoBoom, they're also boring, which is why obstacle-course gyms are so appealing: Even after crashing and burning on practically every challenge I tried, I still had hope that the next run-through would be better if only I moved my weight this way or shifted my hands that way. So I asked Bull to show me how to grapple with the slippery hanging silk. Instead of grabbing onto the second trapeze bar with his hands, he grabbed it with his legs, flipped underneath the bar, and easily caught the silk—an iteration of a trick he pulled in 2014, easily one of the most iconic moves in American Ninja Warrior history. As I pumped Bull for more tips, we kept getting interrupted by a kid who'd recognized Bull from the show (and the larger-than-life action shots plastered around the gym) and cornered him for advice. 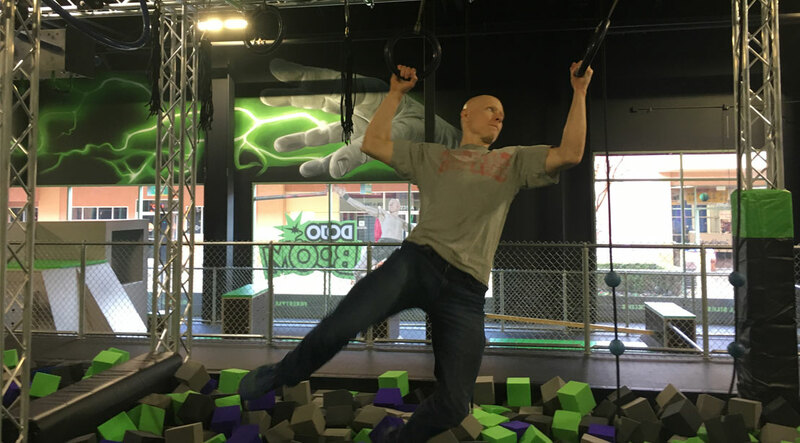 While Bull graciously took selfies and talked about Ninja Warrior, I tried to pull off his signature hanging pullup. It was ... nominally effective: At the end of the day, my grip was so fried I could barely shake his hand. That, as I've found, was the real extreme of DojoBoom—not the obstacles themselves, but the total-body ache that results from attempting them over and over. In that sense, it is a gym like any other, except bouncier, and with more neon-green-and-blue paint. 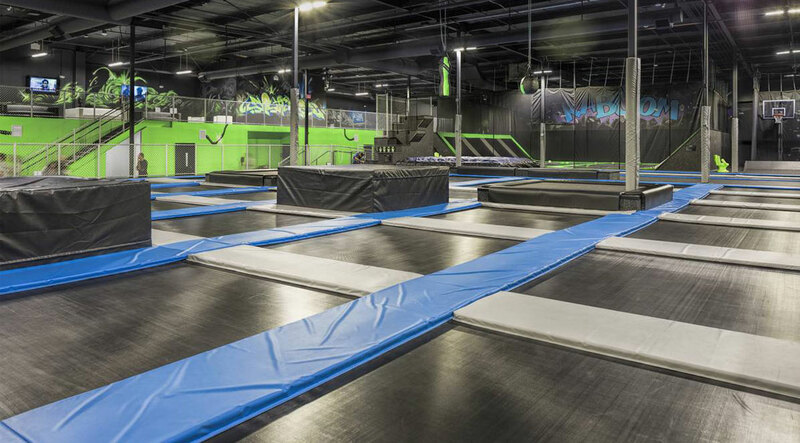 Next time I'm there, I'll be ready for the obstacles—but maybe not for a middle split six feet above the floor. A guide to building the strength and mobility you'll need. If you don't yet have a muscle-up, try this progression. If your gym doesn't have its own indoor bouldering complex, try to roast your grip with these pull-up variations. If you haven't yet taken the plunge and bought a slackline, improve your balance with these advanced yoga poses. If you can't find this Ninja Warrior staple, substitute with 20 box jumps. If you aren't ready to work your spine from the vertical position, here are eight other unconventional core workouts to play with.